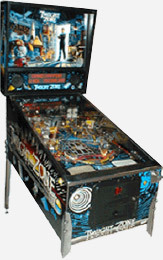 Bring the magic of pinball to your home or establishment! Nothing compares to the old-school feel of a new, electronic pinball machine. Still a great money maker for commercial customers. Doctor Who fans will love this high action great from Bally! Stern Pinball's newest pinball machine! A history making, spooky pinball adventure. When Elvira and pinball come together, they make great magic. entering another dimension of fun! Ohio Vending Machines maintains an inventory of classic and restored pinball machines. Check out our used equipment or contact us if you are looking for a specific machine or parts.